For everyday use, such as walks or exercise, almost any leash is suitable. However, if your pup is struggling with a certain behavior or you’re trying to train a specific skill, your leash of choice may be exacerbating the problem or creating miscommunication in your training. Leashes come in an array of lengths, widths and styles. There’s a leash available to suit every breed and temperament, and to cover the multitude of applications we find in everyday life and training. Essentially all dog leashes have the same basic purpose: to keep our dogs safe and under control while out in public and to serve as a training aid (when used properly). This article discusses all the factors you need to consider when choosing a leash. Why Do We Need a Dog Leash? What's the Purpose? First, in many places laws require owners to have their dog on leash when in public. This is for safety! A dog on the loose could cause an accident, and in case of aggression, it offers some control of our pups. Provides a safe and simple way to handle & communicate with our dogs during training. Prevent your dog from wandering in inappropriate places. Prevent running into the road injuring themselves and perhaps others if they were to cause an accident. A means to temporarily tether your dog so they're safe if you cannot give them your attention for a few minutes. A leash is an essential tool to use during the early days of puppy-hood to keep them safe and aid you in training. And it's a convenient tool for control and communication throughout the rest of their lives. The purpose, what are you using the leash for? There is quite a lot to consider and that's why there are thousands (literally) of choices available. Let's go through each of these important points so that by the end of the article you'll know exactly what style, type and size of leash you need and why. Then you'll be able to buy the right leash with confidence. Not taking into account different materials used, lengths, widths, colors and more, dog leashes can be grouped into just a few major types as described below. This is the most common type of dog leash used for everyday walking and basic training. They're usually made from Nylon or leather, although other materials are available such as cotton and rubber, but these aren't as durable and so are far less common. Nylon and leather are both tough enough to restrain an adult dog, yet lightweight enough for use with a puppy. They measure between 4 and 8 feet in length with 6 foot being the most common. 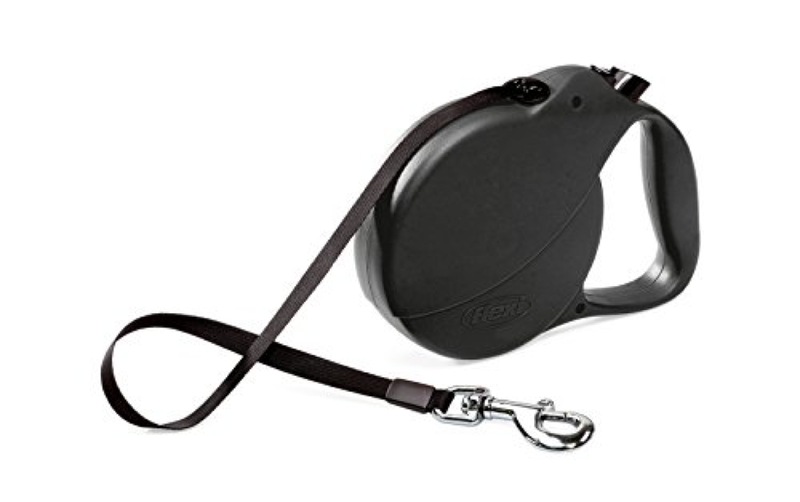 This length allowing plenty of room for freedom of movement while being short enough to afford the handler complete control of their dog if necessary. We recommend a 6-foot leather leash to every one of our clients for everyday use. Retractable dog leashes allow you to vary the length of leash you allow your dog for freedom of movement. They work much like a measuring tape with a nylon cord that can extend anything from about 4 to 30 feet, with a locking mechanism in a plastic handle that allows you to lock the leash at varying degrees of length. They then automatically collect up any slack in the leash when you release the mechanism, retracting the line into the handle. These dangers aside, using a retractable leash without a proper understanding of the tool could result in teaching the dog to pull! At almost all times a retractable leash will have tension on it, unless of course our pup is walking towards us. While walking away they are “pulling” to extend the leash to get to wherever, or whatever, they are trying to go or get to. The behavior is then rewarded once the dog reaches their goal. How confusing is this for the dog? Once we decide to reel our leash in and ask that our dogs then stay at our side they resort to pulling away to get to what they want. In most cases, if they pull on the leash, they get to go where they please, and now they’re not allowed. Confused, we know our dogs will resort to whatever is the most rewarding…. So of course, they begin to pull on our leash. We do not recommend the use of retractable leashes until your pup has a solid understanding of leash etiquette. Only then, will this leash serve as a useful medium that offers control for you and freedom for your dog. Adjustable leashes serve as a good alternative between standard leashes and retractable leashes by offering you a leash that you can adjust the length of without creating a constant pulling sensation for our dogs, allowing us firm control, and offering freedom to the pups at our discretion. Adjustments are usually available from between 3 and 6 feet by the addition or removal of loops, or extra clips along the length. These can allow you a shorter leash to use for training such as heel work when you want your dog very close, while giving the option for more freedom if out on a walk. This type of leash is a replacement for the standard leash, very useful for dogs that tend to chew and destroy their leashes. They're available in various weights and thicknesses so are suitable for all sizes of dogs. It’s important to monitor your companion when using a chain leash. If your dog doesn’t learn quickly that the leash is indestructible and stops the chewing it could potentially lead to damaged teeth. This type of leash is an all in one combination of a standard style leash and a martingale collar. They're used as a training aid when trying to prevent a dog from pulling. Like any collar, it tightens around the dog's neck when it pulls, not choking your poor dog, but putting just enough pressure on their neck to act as an aversive, making it uncomfortable if they do pull and therefore discouraging the behavior. This type of leash is used to walk multiple dogs on the one single leash. You have the one handle and a leash to your first dog, with a second leash (and maybe more) coming off from a coupler to allow you to attach another dog. For well-trained dogs that walk nicely and don't jump around or pull, these are quite effective and useful for owners with multiple dogs. I've found that it is very difficult to use anything more than a double dog leash, but it is possible. Seat belt safety leashes are a short leash with a clip one end to attach to your dog's collar and a seat-belt clip the other end so you can secure your dog in the back seat of your car. This prevents them from climbing around and distracting you when driving. It also prevents them wandering off in case of an accident as they're secured to the car. It's always better to utilize a crate if possible, but if this isn't a possibility, then a seat belt safety lead is your next best option and certainly better than not securing them at all. While some might not think of a harness as a type of dog leash, it absolutely is! Many dogs will benefit from using a harness instead of a traditional style dog leash because it gives the owner a firmer amount of control over a dog that needs guidance. On top of that, dog harnesses are thought to be more comfortable for dogs and easier for them to adjust to, making them a win-win for many owners. A no-pull harness is one of the most popular items for owners who have big dogs while like to pull. Harness-type leashes come in back clip harnesses and front clip harnesses. They each have their benefits, but generally speaking, back clip harnesses are better for well-trained dogs, and front clip harnesses are better for dogs who may jump or pull. For aggressive dogs, you will want to pair a harness with a head halter. Active dog owners with active dogs may want to consider using a dog bike leash to take their pet out on their exercise route with them. This type of leash is attached to the frame of your bicycle, and it gives your dog an adjustable amount of distance from the bike that they can move. With training, this means that your dog will be able to job alongside of your while you bike without the fear of them running away. Using this type of leash can be difficult, but after your dog is used to it, it's a great way to get both you and your dog's exercise in each day. Dog leashes are available in many different materials that each have strengths and weaknesses. I'll quickly discuss what these are below. Nylon has the benefits of being a relatively cheap material, yet hard-wearing and strong. So, for a very reasonable price you get a good, durable leash. Being a man-made fiber, it's available in a wide variety of colors and even multicolored patterns so nylon leashes offer a buyer the biggest scope for individuality if you fancy a leash that looks a little different. Nylon doesn't shrink when wet and dries out fairly easily. It's also easy to clean, so it's a good all-round material. They can be quite harsh on your hands causing friction burns if your dog is a puller and it rubs against your skin. Leather leashes are costlier than their Nylon counterparts. But with the price tag comes a little more class and style (if you like that sort of thing) and a very durable and long-lasting leash. Nylon leashes have the tendency to fray over time whereas treated leather dog leash can literally last a lifetime. They aren't impervious to chewing but are very strong. But with this strength comes a nice little fact that they soften and change shape with age to suit the hands of the handler that uses them. This makes them far more comfortable to grip. And leather isn't as abrasive on your skin as nylon either. Leashes made of metal chain are the least popular of leashes available but are well suited to those dogs that just will not stop chewing their leash. They can be quite heavy depending on their size. Be sure to consider the weight if using with a small puppy. Make sure the chain is as thin and as light as can be. But you will have to upgrade to heavier tougher ones as your dog grows so it will not break when they pull as a strong adult. Like a standard leash (which in effect they are), reflective leashes are usually made of leather or nylon but with the addition of a reflective material embedded into the leash. These leashes, in combination with a reflective collar, are good to use for owners that walk their dogs along country roads at night that have little in the way of wide pathways but have cars and cyclists going past but close by. To most people the width of a leash may not seem important, but it really can be. If your dog is a chewer, or strong and a puller, the last thing you want is them to snap through the leash. And this could and does happen, especially with thinner leashes. So, get a leash that's wide enough to be strong enough for your dog. On the flip side of this, if you have a little dog or young and small puppy, you don't want a very wide leash as they're often heavy and a bit restricting for them. The clip must be strong and reliable because the best and strongest leash in the world is useless if it doesn't stay attached to your pet's dog collar. You want to buy a leash with a good quality metal clip. And because the leash will regularly get wet, it will preferably be made of stainless steel or brass to resist corrosion and avoid weakening over time. The clip must be strong enough to withstand a good deal of force because there may come a time when you and your dog are pulling in opposite directions with all your strength. In this instance, when they try to bolt the clip must never break! The two most common types of clip are 'bolt snap' and 'trigger snap'. This clip has a little spring inside a shaft that you slide open to create a hole to pass a collars ring through. These are a quite reliable clip, hence their popularity, but over time the spring often weakens, and the clip can start to work loose resulting in your dog being able to escape the leash. For this reason, I find the 'trigger snap' more reliable. This clip is also spring-loaded, with a little trigger you use to lever the clip open. But these clips tend to be bigger and more robust with a larger spring than a bolt snap clip so don't become weak as easily. Because they open inwards, when your dog pulls, the tension created actually holds the clip closed with more force. So, they're far less likely to come open and have your dog escape his leash. So, my recommendation would be a trigger snap clip, but bolt snaps are very common and are a fantastic clip, just check the strength of the spring every couple of weeks to make sure it's still strong and will remain closed. When choosing a leash, first think about where and how you will be using it. Is it for everyday use? For leash training indoors or outside? Are you considering a leash to help in beginning distance command training? We recommend a 6-foot leather leash. Unless training distance commands for which you should get a 30 to 50-foot-long line. This will give you a firm control, has a good weight for handling, and doesn’t give rope burn like a nylon leash. The best dog leash to use is a traditional, 6-foot Nylon or leather leash. 6 foot is long enough to provide freedom of movement while keeping your dog close and under your control. Whether Nylon or leather...that choice is up to you. But avoid other materials such as cloth and rubber as they aren't as strong or durable.